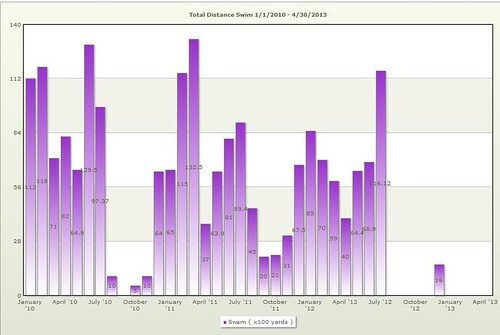 In April I had my third ever hundred mile running month. The last time I had one was a month before my 5 minute half marathon PR. If I could string a few of these together, I might be able to have another running PR. 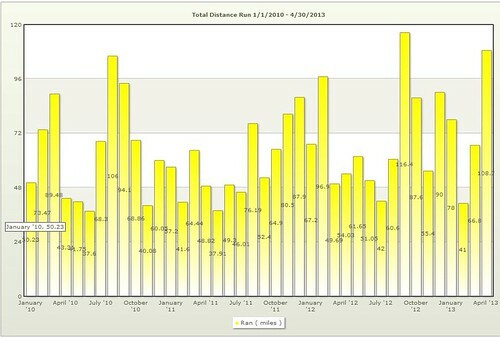 For now I'm happy not to be injured and that I got 100 miles running in April even with traveling every week. 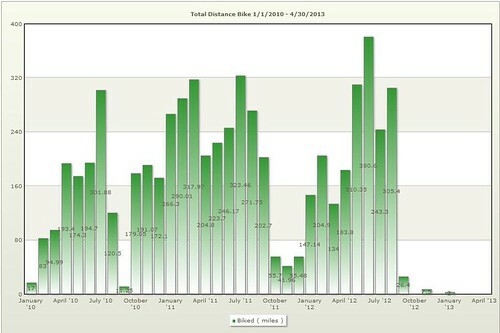 Unfortunately my bike and swim graphs don't look so good. I am totally at peace with it though. Work has to take precedence since triathlon racing will never pay the bills for me. I do miss cycling. I have plenty of alone time with all this traveling and cycling is a lot of alone time for me so not a total loss. I'm not a strong swimmer and likely never will be but I do miss the solitude involved with swimming. At least my last race involved my best race swim yet. In other news, I am still getting my cooking time in on the weekend. If you follow me on twitter and/or instagram, you've already seen these, but they are worth seeing again. :-). 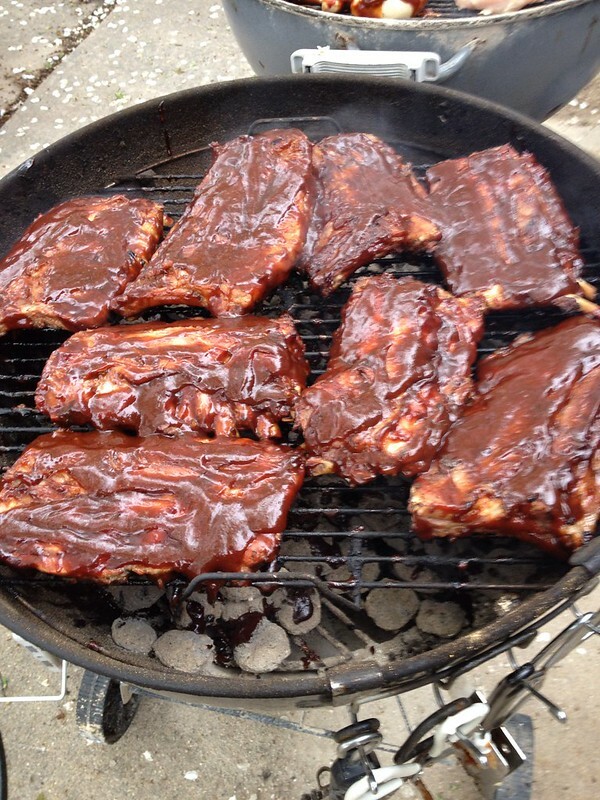 I like my neighbor's recipe for baby back ribs. I made this up based on my wife showing me some Facebook post. It turned out amazing. 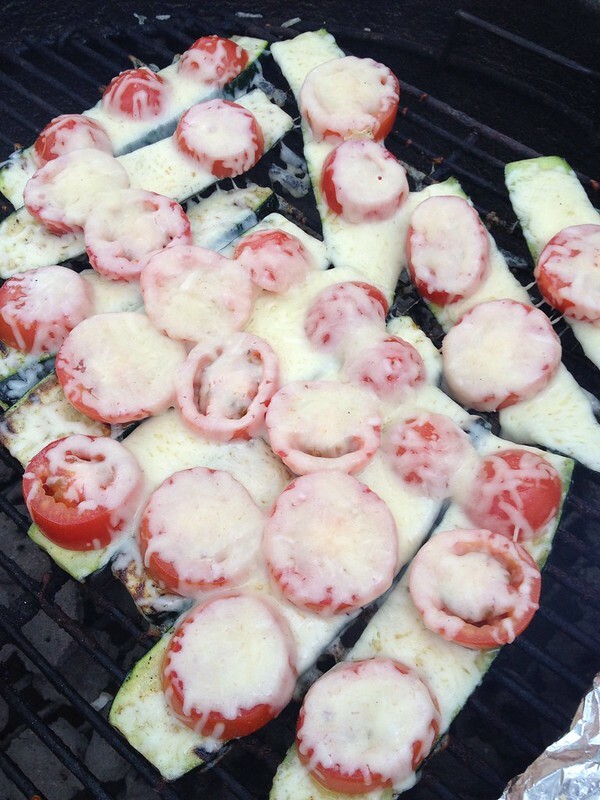 Grill side one for five minutes, flip then add Roma tomatoes and cheese. Grill another five minutes or until the cheese looks done. So what is medium heat on a charcoal grill? If you can hold your hand about two inches above the grant for about 2-3 seconds, no more, no less, that is perfect. Enjoy! Woohoo, congrats on your 3rd place highest mileage finish!! I think that deserves a bronze medal :). I haven't traveled for work since before my kids were born (that was a LONG time ago) but I remember running a lot when I did travel, simply because what else is there to do besides watch mindless television (well, that's fun sometimes too :)). Keep up the great work...and try to figure out why you're posts aren't showing up - I hate missing them. Dang ... now I want ribs! Great job on you monthly milage!! Keep pushing, PR's are in your future!! Thanks for the tip on the grilling heat. I never know how much to use. Congratulations on a strong running month. I love how you can take running anywhere. You know your priorities are in the right place from the peace of mind you have about what's going on in your training (which looks mighty good to me). Can't look at run without swim and bike and really get a sense. I think you should look at it as a big success given all the travel. PS: I want some ribs too. Really impressive stats considering how much you travel! You are really blogging up a storm! I am so happy to be back biking and running. Went for a great bike ride after work tonight with a colleague. It's light out and warm, can't beat it. Congrats on the strong running month Mike. I really think all of your trail running is going to translate into much faster road racing when you set out to your next race. I'm not a rib fan but that zucchini looks amazing!! I don't think I've ever had a 100 mile month...congrats!!! Yes those ribs ARE worth seeing again. I'm going to try the apple cider vinegar trick. congrats on your 100 mile month...awesome! 100 miles is a BIG deal! Congrats.